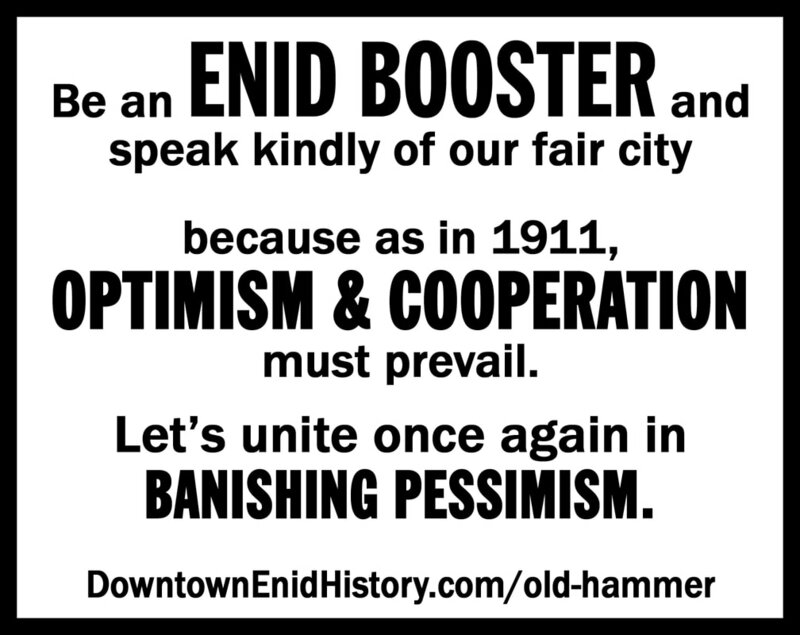 In 1911, citizens of Enid who called themselves Boosters (those with optimistic purpose) built a giant hammer as a symbol of the Knocker (those who knock progress and ideas) and held a Knocker Parade and funeral for Old Hammer, symbolically burying pessimism that was holding Enid back. Escorted by 15 pallbearers and the Enid Band, followed by several vehicles and community leaders, the parade started at the Chamber of Commerce (currently known as the Bell building), went around the square 1.5 times, then lowered Old Hammer into its grave, near the SW corner of the square, likely across the street from the current Non Profit Center (previous Newman's building). Horace Greely McKeever delivered the funeral oration. News of this elaborate event spread far and wide, and made a positive impact on the community. Enid residents were encouraged to wear red hammer pins on their lapels, as long as they pledged never to knock again. They threw their paper hammers into the grave, symbolically buried pessimism and celebrated Enid's bright future. They thought this would never happen again. 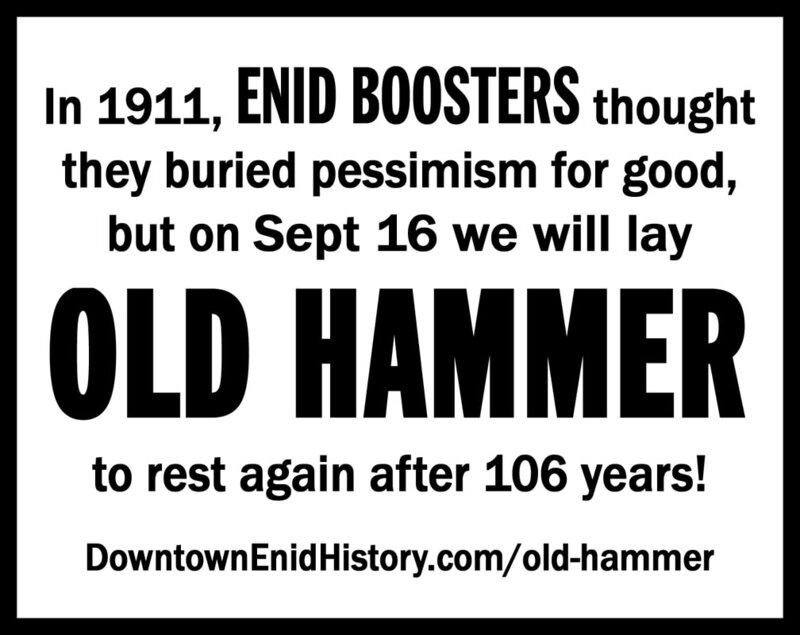 106 years later, in 2017, Enid citizens encouraged residents to be Boosters for our community and began building a new giant hammer. On September 16, 2017, Old Hammer was in the Cherokee Strip Parade around the downtown square in the morning, escorted by 20 pallbearers wearing red hammer Enid Booster lapel pins. 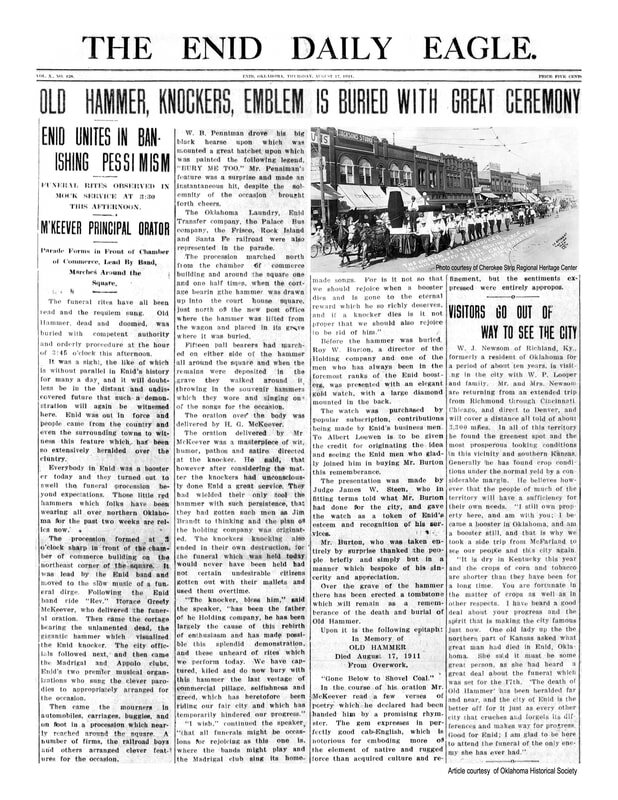 That evening, the Old Hammer Funeral & Celebration took place on Enid's brick street, the 200 block of E Maple. Ben Ezzell delivered the funeral oration, asking that we all lay down our hammers and celebrate Enid's bright future again. Find out what a Booster does versus what a Knocker does!